The State pre-events for the National Day of Prayer & Fasting over last weekend have been a great success. This week, many are pouring out their hearts for Australia in prayer leading up to the National Day on Sunday. Who would have guessed how vital this would be in the DESTINY of our nation as we planned towards these events over the last year? In this Update, we would like to inform you of some details and resources that will help you participate in these events whether in starting next weekend. It truly was amazing that the QLD Day of Prayer & Fasting was booked into the room in Parliament House where a surprise Saturday LNP Party meeting would normally have been held. Parliament House honoured our booking, despite our sponsor not being re-elected. So the LNP met in the room immediately below us to elect their new leaders as nearly 200 Christians prayed above! 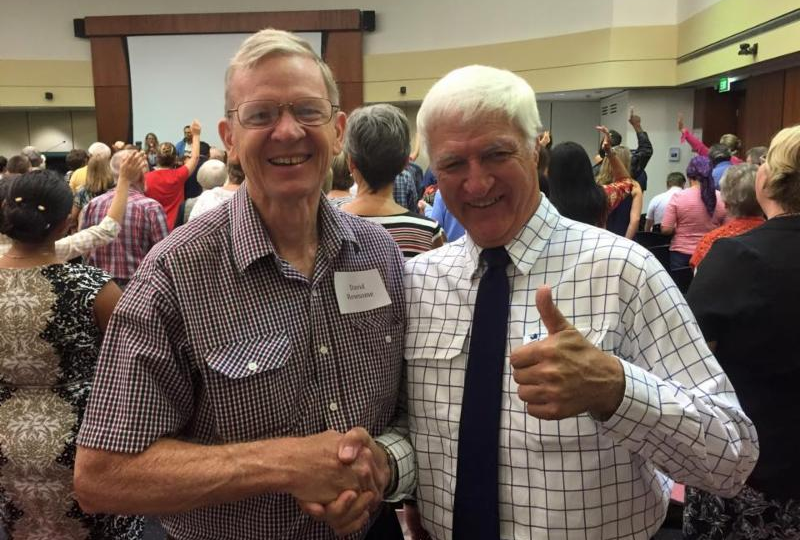 It also meant that Bob Katter, leader of the Katter Party, and later their 2 re-elected members, came into the meeting, spoke to us and we prayed for them. They are now deciding which party to align with. Only God could have orchestrated that! More stories are found at Stories and Comments from 2015.
influencers in our communities for truth and justice so bringing transformation in our society. There is still time to organise a pre-event or pray specifically for Australia in a prayer meeting from now until Sunday. If you want your pre-event to be put on the website so others can join you, please reply with the details or type them in the comments at the bottom of the website page. If you registered for a past event but haven’t done so for this year, we would encourage you to do so now. This means you will receive a name tag on entry at the Great Hall if you are going to Canberra. It will allow us to update your records too as we have many emails bouncing. 1. For those who will make the journey to Canberra for the Prayer Service 10 AM – 4PM AEST in the Great Hall in Parliament House on 15 February, here are some suggestions. Please read about visiting Parliament House on the official website where you will find information including how to get there and where to park if you are coming by car. Please arrive half-an-hour early so you can go through security and receive your name tag and welcome package. The event starts at 10 am sharp. You can enter and leave the Great Hall throughout the day. The Canberra Bible Reading Marathon will be held for 72 hrs from Thurs Feb 12th 10am to Sat Feb 15 10am continuously day and night in two locations: in front of New Parliament House to the side on the grass near the Ceremonial Stone, and under the flag pole on the City Hill roundabout. Praise God the Word of God will be read out loud over Canberra by around 500 Christians before the Prayer Service. The Canberra House of Prayer are also hosting a prayer meeting on Saturday evening. See here for details. 2. For those participating in local churches around the country on Sunday, there are resources you can share with your church leaders. You might have 5-10 minutes in the service when this Short Prayer and Declaration are read. The whole service may be given to prayer for Australia. You could follow this Sample Service. You might have a prayer time after your main service, or in the afternoon, so those who wish can pray for a longer time even fasting over lunch time. 3. For those praying at home or in other groups, these guidelines will help you. The group can be as small as two prayer partners or a family unit. You may already be meeting together as a home group or special interest group – consider having a special prayer time this Sunday. Watch some of the live webcast from Canberra together and then pray. As well as the resources mentioned above, there are books, YouTubes and songs in Suggested Resources. When you register for the National Day of Prayer & Fasting you are also asked about how you would like to participate in the 40 Days of Prayer & Fasting. This season of prayer, this year called the 40 Days of Delight, begins on Wednesday 18 February (Ash Wednesday, the beginning of Lent) and continues until Palm Sunday 29 March. This is a time to prepare our hearts as we move towards Easter. You can choose to fast as the Lord leads you and according to your experience of fasting in the past. We suggest you try a Daniel Fast. Resources to prepare you and help you are found here. Please follow this Five Point Prayer Plan for DESTINY. This year the daily devotions have been written by Sue Tinworth and are based on the Passion Translation of John’s Gospel. If you requested the daily devotions when you registered for 2015, they will be sent daily to your inbox. If you didn’t and you must register to receive them. The devotions will also be available on the 40 Days website and posted on Facebook. If you want to print them, a PDF document will also be on the website. You can check on the website if there is a venue near you hosting a prayer event. If you would like to organise a prayer meeting in your location during the 40 Days, please email Sue Tinworth with the details. There are considerable costs involved in such an event. and calling a nation to pray. but much more is required to reach the budget of $120,000. but also through many smaller donations. that we are able to raise $10,000 in donations before the event on Sunday. Are you able to sacrificially give towards calling our nation back to God? We will need helpers for the Canberra event on Sunday. please respond by return email. We look forward to our fellowship in united prayer this weekend. As we come before the throne of grace, let us expect great things from God for Australia. Trailer on ‘DEEPER’ – A 30-min DVD on the story of the National Day of Prayer and Fasting 2014 with a bonus documentary called ‘The Power of Prayer’. You can receive a copy for a donation of $20 or more. This includes postage.